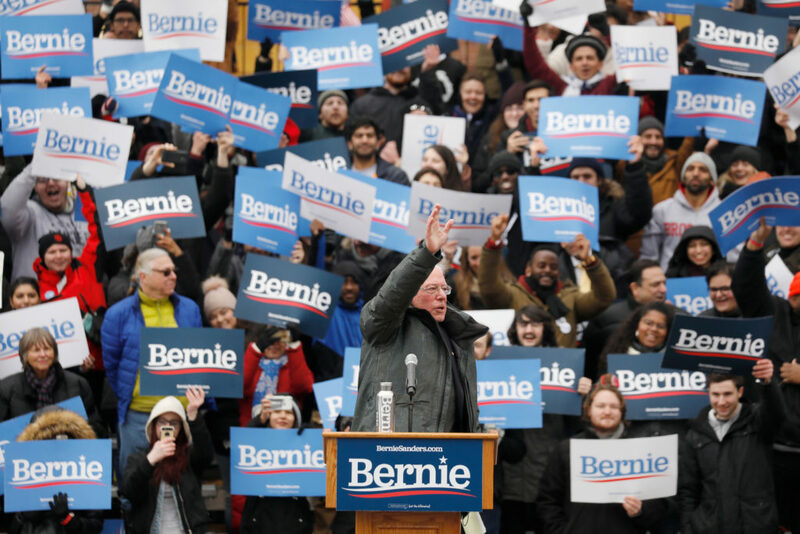 Bernie Sanders kicked off his 2020 presidential campaign with two rallies of over 10,000 people each in Brooklyn and in Chicago over the March 2-3 weekend. Taken with his impressive initial fundraising – over $10 million in the first week, with no money taken from corporations or big business – Sanders is acting like a front runner. “[Our] campaign … will not only defeat Donald Trump … but with your help, we are going to transform this country and finally create an economy and government that works for all of us not just the one percent!” exclaimed Sanders in his Brooklyn speech. He went on to explain how all the issues he campaigned on in 2016 had been first rejected by the mainstream media and political establishment and now were hugely popular, like Medicare for All, free public college, and $15 minimum wage. It is a testament to the changing perception of Sanders and socialism that he can boldly campaign to win. However, we must strike a note of caution that the Democratic Party establishment is no less opposed to Bernie this time around and will work overtime to prevent him from winning. We need to be equally as clever – Socialist Alternative argued that running as an independent would have taken away the Democratic Party’s ability to sabotage Bernie in the primaries, and freed his supporters to campaign through the general election. With one million volunteers and a growing campaign war chest, Bernie’s campaign is already proving to be a powerful force. The infrastructure being built up needs democratic structures so that ordinary working people can have a say in the direction of the campaign. A mass democratic organization at the base of the campaign could be used going forward to support other working-class candidates who take no corporate cash. This would lay the basis for a new left working-class party. Bernie has not yet publicly raised a strategy for overcoming the establishment opposition within the Democratic Party. For this early in the election cycle, Sanders is focusing on gathering supporters together more than any of his opponents. The movement around Bernie’s campaign is vital to making progress on the progressive demands as well as building support for his candidacy. In 2016, Sanders once described his vision for the presidency as being “the Organizer in Chief,” mobilizing people from below to put pressure on Congress to pass legislation not acceptable to corporate America. While we want Bernie to win, we must build these movements for universal health care, full funding for education, criminal justice reform, and a Green New Deal now if we are to have any hope of wrestling these concessions from the cold corporate hands that dominate the economy and politics. Political opponents of Sanders attempted to paint the rallies as mostly white and male, but attendees were greeted by diverse crowds with impressive turnouts of black New Yorkers and Latino Chicagoans. Women were also in attendance in great numbers. As you walked down the blocks-long line to get in, the diversity of his supporters was as clear as day. Our Revolution Executive Director Nina Turner and journalist Shaun King joined Bernie at both locations and focused their messages on issues facing the black community and Bernie’s record. Polls indicate that Bernie is starting this campaign with much greater name recognition and popularity among people of color than in 2016. The corporate establishment in both parties financed by the health care and insurance industry will not give up for-profit health care so that we can have Medicare for All without a knockdown, dragout fight. Likewise the fossil fuel industries will fight tooth and nail against the Green New Deal. This system that puts profits ahead of human needs is tied by a thousand strings to the political establishment. We have to be ready and willing to organize on the streets, in our communities and in our workplaces. We should tie this fight to pointing out the limitations of capitalism – that if this system can’t give ordinary people a decent standard of living, then we need to replace it. While in Los Angeles on March 21, Sanders visited UCLA workers’ picket line and was greeted enthusiastically, showing that workers moving into struggle are looking to Bernie. However, a focused approach to winning unions to support Bernie is needed. Like in 2016, Labor for Bernie groups can be started in union locals as a way to not only build support for endorsing Bernie, but importantly as way to raise support for Medicare for All and other vital policies. While Bernie may seem like a frontrunner now, he is in for the fight of his life as the establishment settles on its best opponents and turns its guns at him, the working class, and the rest of the left. Socialists must be there to fight alongside the millions who share the hopes embodied in Sanders and his platform.